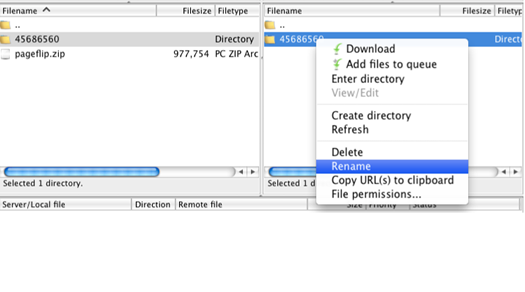 Filezilla is 100% free (it’s open source) but it’s a great FTP client. Connecting to your website is quite easy but you have to have the right FTP information. If you don’t know what your FTP information is, please contact your webmaster or your hosting company. 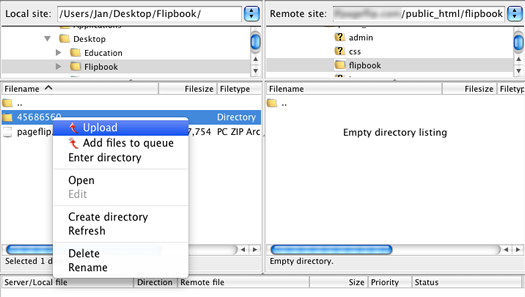 When you start Filezilla, look for the “quickconnect“ button in the top of the screen like you see below. This is where you need to put in your FTP information. The left side of the screen is your local computer. 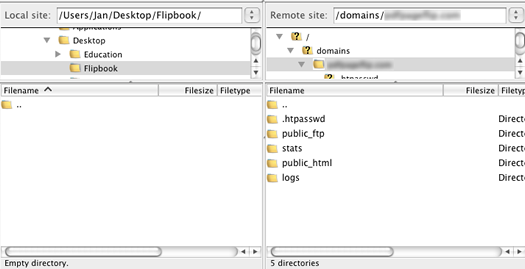 On the right side you find the files on your website’s server. The next step is to navigate to the root of the website. In this case it’s the folder called “public_html“. Simply double click on it and it will show you the files on your website. Now you’re connected, lets start transferring the files from our local computer to the website. As you can see in the below graphic, I’m in the directory that contains the extracted flipbook on the left, and on the right it’s the website folder of where I want to have the flipbook. Just right-click on the folder on the left and choose “upload“ and it will start transferring all the files to your website. This can take a while, depending on how large your flipbook is. Once it’s finished uploading, you can right click on the folder on the right and choose “Rename“ to give it a different name like for example “flipbook“.